CHARLOTTE, N.C. -- The San Diego Chargers lost two young impact players in the first half of Sunday's game against the Carolina Panthers. 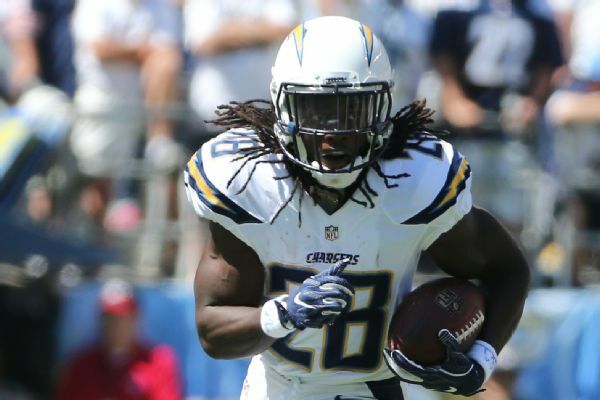 Second-year pro Melvin Gordon suffered a hip injury midway through the opening quarter. While trying to recover a Philip Riversfumble, Gordon was hit in the back by Carolina linebacker Thomas Davis. Gordon was carted off the field and did not return. He is expected to get an MRI on Monday. In the second quarter, 2016 first-round selection Joey Bosa injured his neck bringing down Carolina quarterback Cam Newton for a sack. Bosa remained on the field for a few minutes while trainers looked at him, but he eventually got up and walked off on his own. Bosa leads the Chargers in sacks with 6.5 in nine games played. Entering Sunday's game against the Panthers, Gordon had 992 rushing yards and 12 total touchdowns, impressively rebounding from a rookie season in which he failed to get into the end zone. Gordon left the game after totaling 5 yards on three carries. After Philip Rivers fumbles the ball, Melvin Gordon goes for the recovery and gets hit awkwardly from behind by Panthers LB Thomas Davis. Gordon would remain down and would eventually be carted off with a hip injury.